Historically daughters were not considered for succession into ma­n­a­­gerial positions in family businesses. Historically daughters were not considered for succession into ma­n­a­­gerial positions in family businesses. Gender used to be a main fact when determining a successor, with males being preferred. If daughters were brought into the business they were expected to carry out lower-level tasks, not be leaders. Daughters used to be willing to join the family business for various reasons such as to help the family, to fill a position nobody wanted, to have more flexible schedules, and to increase their job satisfaction. The reality for many now – although not for all – is more positive and there is a shift in mentality. More recently, women have gained more managerial experience and education. However, families which do not consider daughters as viable successors to their family business still exist, as do situations where daughters find themselves working harder to prove their abilities and be more visible. Women in family businesses still face discrimination and stereotyping as a result of societal prejudices. The roles and patterns of behaviour in families are often gender-specific. 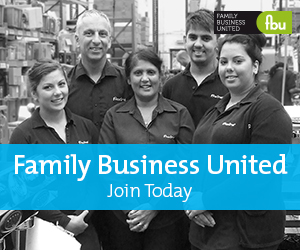 When family members work together, patterns of behaviour, value beliefs and expectations are often transferred to the work environment of the family business. Why are there women in family businesses who still, to this present day, are not being groomed for future leadership roles? Reasons vary and may include the parents’ need to protect their daughters more so than sons, and avoiding their daughters having to deal with problems that come with managing a business. Alternatively, work-life balance considerations may keep daughters from seeking leadership roles in the family business. Daughters may receive mixed messages from the family. Parents may encourage daughters to have children, butat the same time, they might complain if the daughter neglects the business. Fathers sometimes fail in defining the daughter’s role in the business, expecting her to behave as a businesswoman while perhaps treating her like Daddy’s Girl. These multiple roles can confuse the daughter because she will not know when to act as an employee and when to act as a daughter. Tension is generated between both parties, making it difficult for the daughter to establish her sense of identity. This conflict can be magnified when the outside world recognises the daughter as an adult, while the family may still see her as a child. Positive characteristics may be taken to an extreme and become detrimental for the daughter; characteristics like daughterly concern about the father and the business, seeing parents as mentors, and a tendency to avoid conflict. Some women may identify with other scenarios: a daughter obtaining a better position in the family business, contributing to sibling rivalry, and family tensions. Daughters might have to choose between gaining respect in the business hierarchy or the family hierarchy. Research shows that daughters have typically carried out three roles in family businesses. The first is that of the “invisible”. The “invisibles” are generally part of a large nuclear family and are not included in family succession plans. A perceived benefit of invisibility may be that daughters may leave and come back into the business as they wish. The second role is the “anchor”. The “anchors” come from families with few men in any generation. They are essential for the continuity of the business. They are guided from a young age as well as in their education to work in the business. They are offered very little alternative and may be ambivalent about their careers in the business. The third role is that of the “professional”. The “professionals” work in the mature family businesses with complex ownership structures, where a reasonable number of men also work. They interact professionally with the business. Another role is emerging for the woman in family businesses: the entrepreneur who starts her own venture. As women are starting successful family businesses, daughters are increasingly being considered as possible successors of the business. Differences between men and women should not be denied as when denied difficulties arise. Family businesses are a kind of environment particularly attractive to women due to the simultaneous valorisation of both the private aspects of family life and those of professional life. The recommendations for next generation women are to get an education and work experience outside the family business, not to take over the business unless they are passionate about it, compete on a male level while respecting oneself as a woman, work hard to achieve personal goals and trust inner instincts. Roberta Fenech is an occupational psychologist currently reading for a PhD at the University of London.